No title. An intricate double hemisphere world map from a Keur bible. The Keur family were active bible publishers from the mid 17th to mid 18th centuries. 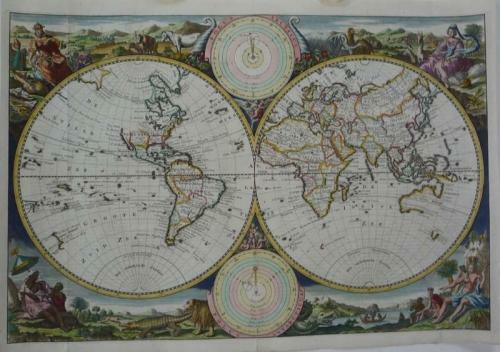 The engraver/designer for this map was J. v. Jagen (sculps. et dir. ; engraved on lower central edge of plate just inside neatline). Two smaller spheres upper (Polus Arcticus) and lower (Polus Antarcticus) center. The majority of place names and verso text are in Dtuch. The decorative allegorical surrounds.